La France takes a very familiar premise into uncharted territory with unexpected results. The prospect of a “war musical” might seem to belong to the Sixties (remembering Richard Attenborough’s Oh! What a Lovely War), but actor-turned director Serge Bozon does much with the concept here, fashioning a film that is faithful to both genres. 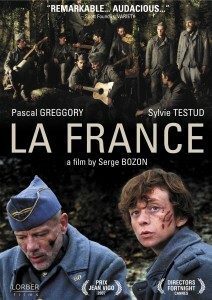 The plot revolves around a young woman (Sylvie Testud, La Vie en Rose) in WWI-era France who seeks news of her boyfriend, so she disguises herself as a teenage boy and follows an army regiment. The film turns from Shakespeare to Brecht, however, when the soldiers she travels with — who are keeping their own secret — suddenly begin to sing as they relax from their odyssey. La France may not be for those seeking a John Wayne-style gung-ho war movie or a colorful Gene Kelly musical, but it will please film buffs seeking a different kind of cinematic hybrid that rewards attentive viewers.